In addition to close supervision, CPSC recommends layers of protection, including barriers, such as a fence with self-closing, self-latching gates, completely surrounding pools to prevent unsupervised access by young children. If the house forms a side of the barrier, use alarms on doors leading to the pool area or a power safety cover over the pool. It is important to always be prepared for an emergency by having rescue equipment and a phone near the pool. Also, parents should learn cardiopulmonary resuscitation (CPR). Parents may think that if their child falls in the water, they will hear lots of splashing and screaming, and that they will be able to come to the rescue. Many times, however, children slip under the water silently. Even people near or in the pool have reported hearing nothing out of the ordinary during drowning incidents. CPSC’s website provides information about the Virginia Graeme Baker Pool and Spa Safety Act and how to prevent drownings and entrapments. Provides guidelines for barriers intended to prevent drowning deaths and near-drowning deaths of children in home pools, spas and hot tubs. Guidelines cover fences, gates, audible alarms for doors with access to pools, and power safety covers. 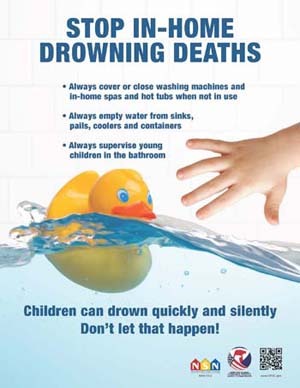 This booklet discusses how to reduce risks of child drowning deaths in residential swimming pools. Gives safety tips and provides guidance for fences and gates, pool covers, barriers, alarms, etc.